Scientists have solved some of the mysteries of the universe and will solve more in the future. Many questions, however, remain open – and some always will. That’s the well-informed opinion of Wilfrid Laurier University astrophysicist Ioannis Haranas and what’s behind the inquiring but never know-it-all attitude he brings to his physics and astronomy classes, including Planetary and Space Science, the third-year course the adjunct professor has taught for the last three years. The course covers topics including gravitation, comets, asteroids, celestial mechanics and planetary structure. As an elective course open to any Faculty of Science student, Haranas shows the students some “heavy math” but doesn’t test them on it. The course concentrates on concepts, both at the far ends of the universe and close up. Sometimes close enough to touch. One highlight of the course is the chance to inspect a meteorite Haranas has on long-term loan from a friend. At nearly 100 kg in mass – the weight of a large man, despite being only the size of a beach ball – it’s not easy to bring to class. 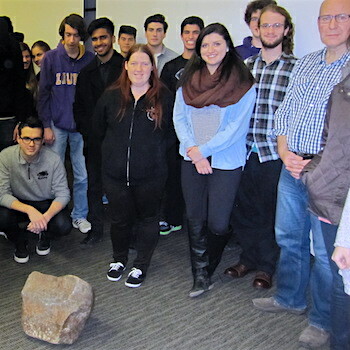 But it’s worth it to see the wonder on the faces of the students when they get up close to a chondrite type B meteorite that hurtled through space and fell to Earth, landing in the Moroccan desert 500 to 5,000 years ago. Haranas has been fascinated by physics and astronomy since he was a child growing up in Greece. Though that particular experiment was a failure, the parental encouragement lit a fire within Haranas as well. In addition to a BSc in applied mathematics, he has two master’s degrees – one in solid state physics, the other in astronomy and astrophysics, which he followed up with a doctorate in planetary and space science. Haranas has never stopped experimenting and he encourages his students to do applied work as well. For instance, he leads the class in a simulation to calculate what would happen in Waterloo if a large meteorite fell in Lake Ontario – would it result in an earthquake, sonic boom or even a tsunami? However, Haranas says not too worry too much about meteorite strikes, especially not ones on the scale of the one scientists believe led to the extinction of the dinosaurs. The chances are astronomically low – literally. But though Haranas is quite certain his grandchildren’s grandchildren will survive Earth’s journey through space, he readily admits he doesn’t know the answers to a lot of questions about the universe – such as where it came from. It’s not that Haranas wants to discourage his students from seeking answers, far from it. But there are limits to science and human knowledge, he says. Haranas says humans will never travel to other stars, never mind other galaxies. Given current rocket propulsion technologies, it would take about six months to get to Mars – a highly perilous journey. Mars is only about 13 light minutes from Earth, which illustrates how far we are from achieving light-speed travel. The closest stars are about four and a half light years away. The Andromeda galaxy is more than two million light years away. Speed-of-light travel is also impossible for a more fundamental reason than rocket-fuel challenges, says Haranas. Even if somehow humans were ever to achieve speed-of-light travel, we would then face problems such as time running differently at different points relative to each other, says Haranas. For instance, if it took a 20-year-old nine years, as seen from Earth, to travel to the nearest star and back, he or she would not be exactly 29 upon return. “The nine years of Earth time will not be the same for astronauts moving at the speed of light,” says Haranas. It’s mindbending stuff discouraging to aspiring Starfleet commanders. But Haranas’s students haven’t minded. Connor Martz (BSc ’17) was enthusiastic to sign up for the course in 2017 after having taken the more basic first-year astronomy courses. Quynh Diem Dao, who is starting her fourth year in physics in September, says that among other things, the course deepened her understanding of Einstein’s theory of general relativity. Cameron Naraine, who will graduate with a BSc in physics in June, calls Haranas an “excellent professor” and his courses fascinating.